Save $40 on any Puppy Manners or Beginning Home Obedience Class through December 25, 2016. Create an Account for yourself and your dog then select the class meeting time that best meets your needs from the classes listed on our website. Christmas Puppy? Puppy Manners HO1 is for puppies 9 weeks to 5 months, very shy dogs and older toy breeds may also find this class a good starting point. Older puppy, new rescue dog or a dog needing manners training? Beginning Home Obedience HO2 is for graduates of our Puppy Manners class, recently adopted dogs or the family dog who needs some manners work. Classes meet once a week for six weeks unless otherwise noted. You are selecting the DAY and TIME that you will meet. The DATE listed is the first class meeting for that six week session. When you check out, enter SANTA40Y under PROMO code to get $40 off your first class at Family Dog Training Center. Be sure to complete your registration by clicking one of the PAY buttons so your place on the roster is saved!! Classes can fill quickly so don’t wait to get you and your Family Dog into a class. Questions? Email moc.e1555669821nilnO1555669821goDyl1555669821imaF@1555669821eciff1555669821O1555669821 or call the office at 253-854-9663. 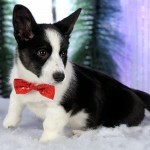 Dobby is a Cardigan Welsh Corgi owned by Theresa Calter. Photo courtesy of Jerry & Lois Photography.